We have worked closely with the Amazon Business team to test and make available all of the newly launched features of Amazon Business for New and Existing users of our listing tool Ad-Lister. Fully integrated to Amazon Business, you can use Ad-Lister to post your products directly to Amazon and make use of all of the newly launched features of Amazon Business including the VAT calculation service (VCS). Please continue reading to learn about the benefits of the Amazon Business programme and the VAT calculation service as well as how to get started using our solution. After having successfully launched in the US and Germany, Amazon Business is now available on Amazon.co.uk. Now, even more business customers can purchase on the new Amazon marketplace – from small businesses to large corporations and institutional buyers like universities, hospitals and non-profits. The Amazon Business programme is available to sellers based in the UK, Germany and internationally, and includes also the top service Fulfilment by Amazon (FBA). As an early service integrator to Amazon Business, we are pleased to announce that we are ready to support Selling to Businesses on Amazon.co.uk and Amazon.de. Our solution is fully compatible with all new Amazon Business features such as Business Pricing, Quantity discount price and the VAT Calculation Service. New and existing sellers interested in the Amazon Business Seller programme can learn more and register here. 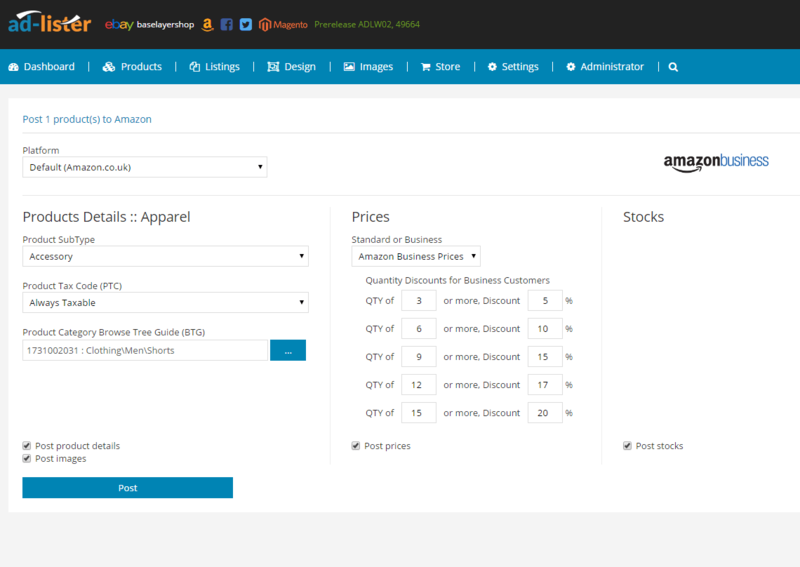 Business Pricing and Quantity Discounts: Ad-Lister allows you to offer exclusive pricing to Amazon business customers and set quantity pricing to offer discounts when businesses purchase larger quantities, or you can manage your pricing directly on Amazon. High offer visibility: Offers from eligible Amazon Sellers on Amazon Business will receive a special badge and benefit from higher visibility. Exclusive Business Offers: Ad-Lister gives Amazon Sellers the ability to make products and prices available to business customers only. Fulfillment by Amazon: With FBA, sellers can store their products in Amazon’s fulfillment centers. When customer orders are received, Amazon will pick, pack, ship and provide customer service for these products. With Amazon’s Pan-European FBA programme, Amazon Business sellers of any size can reach customer in other EU countries. Sellers listing products with FBA make them eligible for free shipping, and for winning the Amazon Buy Box. Using our solution Ad-Lister, you can already get started with Amazon Business and/or the Amazon VAT Calculation Service. Please note that you first need to join the Amazon Business programme and enroll into VCS. You can enroll into Amazon’s new VAT Calculation Service and after activation of the service your offers will show VAT-exclusive prices to business customers on Amazon.de and Amazon.co.uk. This helps you increase your chances to win the buy box. The service, once activated, will also provide VAT invoices on your behalf for all your Amazon customers. Click here to learn more about the service or here for our FAQs. Please note that after completing the enrollment process and Amazon will get back to you within 4 days to verify your information. Activation of the service is expected to happen in the coming weeks. For more information on how we can help, please call our telephone support team on +44(0)121 285 1052 to speak to an account manager trained with Amazon Business.